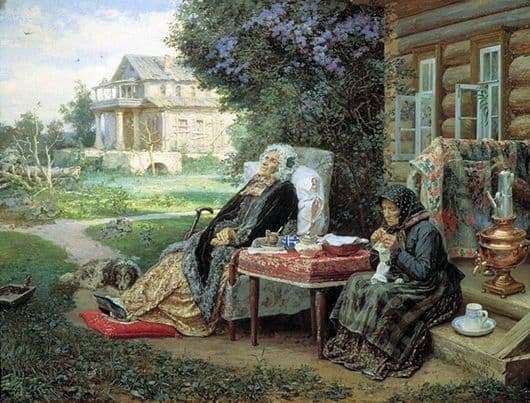 The painting “Everything in the Past” by Vasily Maximovitch Maximov depicts two women of quite advanced years. One of them is sitting on the porch and knitting a white stocking on the needles, must be for their grandchildren. At its head is a black scarf with white polka dots, framed down with a strip of the color of sea foam. The shirt on it, which was once black, now looks like a faded, whitish flax clothing. The apron on it is gray, interspersed into a checkered pattern with stripes of black and light brown, close to ocher – color. The skirt on this woman is long, all the way to the floor, her color is also black with pinkish small and frequent flowers. Behind this woman’s samovar, and next to her on the wooden step is the Gzhel set of a large tea mug and a deep saucer of white and blue tones. A little further away from us through the table from the previous person, another lady of advanced years sits on a chair, she has a powdered wig on her, a large soft pillow along her back under her, and another pillow under her legs, a devotional dog is lying on the floor next to her. The lady herself is in a half-nap, as if putting her face in view of the sun, in the distance we see a mansion obviously belonging to her, and right under her arm is a wand, on which some old people rely when walking on foot. A woman blooms lilac. The clothes of this woman are elegant, in a sense of the word. Yellow colorful dress and a bow around the neck. Butterfly in a wig color concentrated aqua. Gray furs, black shawl and dark azure oriental slippers.